PHP 7 was a great step forward in the evolution of PHP. Many things were added, changed and removed. In the first part of this article it was covered the things that were changed or removed and may break your PHP code that ran with the past versions. 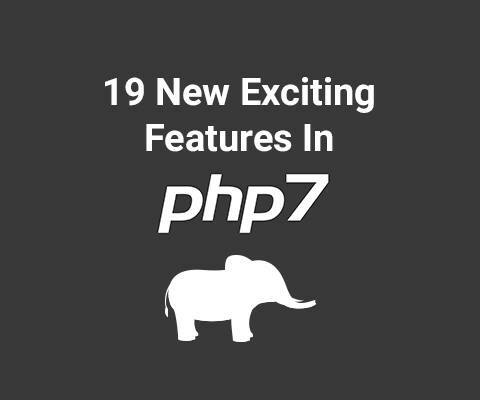 Read this article part to learn more in detail about the new features and improvements of PHP 7 that you can take advantage. In the previous part of this article I talked about top backwards incompatible changes of PHP 7. To migrate to the this newer PHP version, you must be well aware of the new features of PHP 7. In this part I will be briefly presenting the features I consider most exciting of PHP 7, in great part based on a list from the PHP manual. Strictness of typing for scalars will be configured on per file basis. However, keep in mind that if a script is included from a parent script that does not enable strict typing, it will not be enabled for the included child script. A new operator called null coalescing operator (??) has been added in PHP 7. It allows the developers to implicitly use a ternary expression with isset() to determine if a value is set. In case the value is not set, it evaluates to the value second operand. If the first operand value is set, it evaluates to that value. The spaceship operator was introduced in PHP 7 to help with comparing two expressions. It may evaluate 0,1, or -1. This is useful for array sorting functions that take callback functions that must return one of these 3 values depending on how two array entry values compare. Comparisons are made according to type comparison rules. Consider the following example. From now on, in PHP, array constants can be defined with define() function. In previous versions, we could not define array constants not even in classes with the const keyword. In PHP 7, support for anonymous classes has also been added through new class construct. Anonymous classes can be used to create objects on demand without declaring class separately. Consider the following example. Traditionally developers used the assert() function to verify important conditions at run time. In PHP 7 you can pass a custom exception object that will be called if the assert condition value is false. Also in PHP 7 assertions are a built-in construct of the language. This means that if assertions are disabled in the PHP configuration, it is as if the assertion code was not inserted in your PHP code, so they are not evaluated nor executed. In PHP7 it is now possible to import multiple constants, functions and classes from same namespace with a single use statement, thus making the code more succinct. Generators are functions that you can use since PHP 5.5 to return multiple values using the yield command, for instance to be iterated like with array values. Then the generator function is resumed right after the value is used by the calling code right after the yield statement. Since PHP 7 the return command can also be used to return a value like if it was returned by yield, except that it is the last value returned by the generator function. If you need to get the actual return value you can used the getReturn() method on the generator function closure object. In PHP 7 Intdiv() can perform integer division faster than the regular / division operator. With the division operator it could return a float and you would need to convert the result to an integer if you just wanted to get the integer part ignoring the remainder. In PHP 7 session_start() can take an array of options which will override the configuration directives which are set in php.ini . The lazy_write option, which is enabled by default, also makes PHP only rewrite session data if it has changed and the read_and_close is passed to session_start(). This is a much cleaner approach then using multiple preg_replace_callback calls. PHP 7 introduces random_bytes() and random_int() for generating secure random strings and integers. These functions are recommended to be used for cryptography purposes instead of others like rand(). If for some reason you cannot use PHP 7 yet, you can find here an alternative user-land implementation that works with PHP 5.x series contributed by Scott Arciszewski with many other security experts of the PHP community. Before PHP 7 list() command was not working correctly with objects that implement ArrayAccess interface. That issue is fixed in PHP 7. In this part, I have presented in detail functions and features which have been introduced or improved in PHP 7. I work for Cloudways, a company that provides a Managed Cloud Hosting Platform. I would like to take this opportunity to share that our company has recently introduced PHP 7 on its managed cloud servers. You can use it for free on a trial to test the concepts discussed in this blog post. In next part, I will cover the deprecated features, changed functions, new classes and interfaces. If you liked this article or you have questions about the new features and improvements of PHP 7, post a comment here now.